Stephen John Nash was born on February 7, 1974, to British and Welsh parents in Johannesburg, South Africa, (he returned as a CBS correspondent to the 2010 World Cup) into an athletic family: his father, John, played semi-professional soccer and his mother, Jean, netball. After two years in South Africa, the Nash family immigrated to Canada to avoid raising their children amidst apartheid. The family played a variety of sports – including soccer, hockey, lacrosse, basketball and tennis – in Victoria, BC, off Canada’s scenic west coast; Steve’s younger brother, Martin, played professional soccer, and his sister, Joann, was a standout college player. In 1992, Steve moved to Santa Clara University on the only basketball scholarship offered him. After leading the Broncos to three NCAA Tourney berths (and one of the NCAA’s all-time upsets, over the Arizona Wildcats), he graduated with a BA in Sociology, and was drafted 15th overall to the Phoenix Suns in 1996 NBA Draft. After two years behind Kevin Johnson and Jason Kidd, Steve was traded to the Dallas Mavericks. While playing for the Mavericks, Steve’s style of play matured into All-Star status. He found his niche in the NBA and played internationally for Team Canada, including a 7th place finish at the 2000 Olympic Games in Sydney. After a very successful run with the Mavericks, Steve began a new basketball family with the Phoenix Suns, and one of his own – in autumn 2004, Steve’s twin daughters, Lourdes (Lola) and Isabella (Bella), were born. In the fall of 2010, he welcomed a son, Matteo Nash. In 2012, Steve moved to the Los Angeles Lakers in a sign-and-trade deal, where he donned the #10 jersey for the first time on July 11th at the Lakers facility on (no kidding) Nash Street. He announced his retirement from the NBA on March 21, 2015, with an article he penned for the Players’ Tribune. In September 2016, Steve married Lilla Frederick, with whom he welcomed son Luca to the family in the summer of 2017. He now serves as a player development consultant to the Golden State Warriors, soccer analyst at Bleacher Report Football/Turner Sports, and as General Manager of Canada Basketball’s Men’s National Team. He can typically be found creating content like “2DadsUnited” with his film production company, Control Media, and is also an engaged investor, including ownership stakes in the Vancouver Whitecaps and Real Mallorca Football Clubs. Steve’s role as a leader on and off the court have resonated with many, as he provides an energized example of how to give back as President and Founder of the Steve Nash Foundation. Dedicated to assisting underserved children in their health, personal development, education and enjoyment of life, the Steve Nash Foundation provides critical needs health and education resources with a focus on local and national strategic initiatives, including new platforms addressing early childhood neurodevelopment, and health-focused athlete development for children and adolescents. Steve has been named to the Order of BC, the Order of Canada, and received numerous awards, including the St. Boniface Foundation International Award, and an honorary degree at the University of Victoria for his humanitarianism. 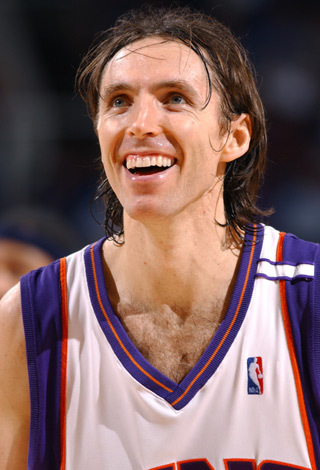 In 2015, his jersey was retired by the Phoenix Suns as he entered the Suns Ring of Honor, and in 2018, Steve was inducted into the Naismith Memorial Basketball Hall of Fame. Having attributed his success to a capacity for discipline and drive to succeed, as well as to his efforts towards nutrition (what became known in the NBA as the “Nash Diet”), and careful attention to adequate sleep, Steve now encourages young athletes to make similar efforts towards their own health and development, and has created “Give and Go” to offer free basketball sessions to kids. Steve and his family live in Southern California. honored as a former Olympian by lighting the Olympic Flame in Vancouver at the 2010 Winter Games. 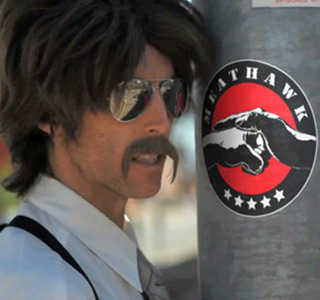 A deep interest in film lead to the creation of Meathawk, a film company run with cousin Ezra Holland. Together, they’ve completed projects for several corporate clients (see below), had an internet sensation with “The Player” (a look at Steve’s dream to play professional soccer), and premiered their first feature film, “Into the Wind,” about the life and journey of Terry Fox, to critical acclaim at the 2010 Toronto International Film Festival (the feature ran as a part of ESPN’s 30 for 30 series) (buy your copy of Into the Wind on Amazon.co, and support the Steve Nash Foundation at the same time! Just use this link). Outside of Meathawk, Steve has been a special correspondent to CBS, both as David Letterman’s man at the NBA Finals, and as CBS’ World Cup correspondent, and featured with Ron Howard on the Sundance Channel’s “Iconoclasts,” as well as in cameo roles on HBO’s “Entourage,” and feature films, and a pretty entertaining appearance on The Late Late Show with James Corden. Steve’s community engagement extends into the corporate realm, with ownership stakes in entities including the Vancouver Whitecaps and Real Mallorca. Steve has integrated his film work into his endorsement portfolio, creating and/or starring in a series of ads for vitaminwater (“the Spokesperson” series, as well as the Revive spot), EA Sports (featuring Landon Donovan), Toyota, APS, and Nike (“The 60 Million Dollar Man,” “Training Day”). A strong environmental ethic informs Steve’s daily choices, and those of his businesses. Steve’s leadership is credited with the installation of the NBA’s first solar power (at the Suns’ US Airways Center in Phoenix), he captained “Team PowerSmart” in British Columbia, and served as APS spokesperson for renewable energy programs and conservation efforts in Arizona. Steve drives a hybrid or skateboards as his preferred mode of transportation. Join us to make an assist, and grow health in kids.